Here’s a look at a textbook in iBooks 2. When in landscape mode, textbooks flow from one page to the next, with embedded interactive content—3D models, videos, and charts. Students can tap and zoom on any content. When in portrait, the content splits: on each page, any interactive content is shifted to the left-hand side, with the text isolated in a Safari Reader-like layout. To search through the book, students can swipe from page to page, browse thumbnails, or search for terms and page numbers using iBooks 2’s search features. Highlighting is also easy enough: Swipe to highlight, then tap to change the highlight color. You can add notes, as well, and any highlights and notes can be automatically converted into new Study Cards; you can use these to study your highlighted notes, or even use them as flash cards with glossary terms and definitions, with a built-in shuffle mode. The typical end-of-book quizzes have also undergone an overhaul: Quizzes have multiple-choice questions with illustrated answers, and immediate feedback for the user. Students can find new-and-improved digital textbooks for iBooks 2 in the iBookstore, which has received a new Textbooks category. Currently, just eight textbooks are available (from publishers McGraw Hill and Pearson), with more slated to arrive. Textbook previews include screenshots and grade level. 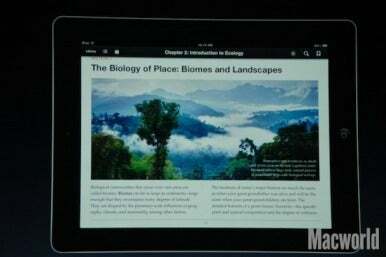 The textbooks themselves are currently only supported on the iPad. iBooks 2 is currently available from the App Store for free. We’ll have more details on Apple’s education efforts later today.